Imagine your body is like a loaf of sliced bread. During an MRI scan, a powerful magnet and radio waves create detailed images of each “slice” of your body, then a computer puts the slices together to show a full picture of your anatomy. But before the slicing comes the choosing. Before an MRI technologist can scan a patient, they have to manually specify the slices they want the MRI to acquire. This process can take several minutes of tweaking and adjusting, leaving a patient waiting anxiously in the MRI scanner and adding unnecessary steps to set up each scan. It can also introduce inconsistencies into images taken over time if parameters or positioning are slightly different each time a patient gets scanned, making it challenging to accurately monitor disease progression or treatment. That’s where a new deep learning software can help. 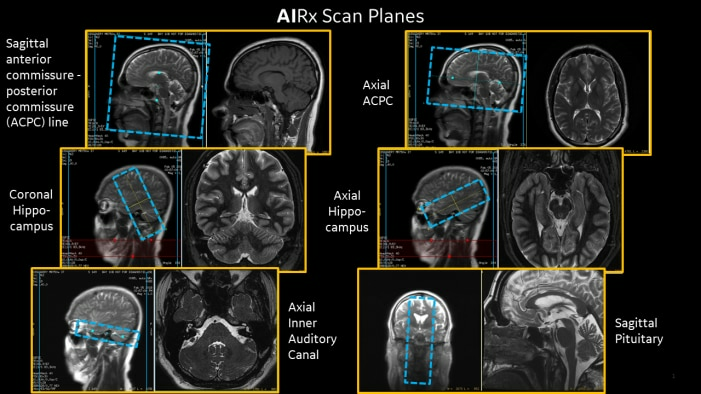 AIRx is an AI-based, automated workflow tool for MRI brain scanning that automatically “prescribes” slices to help reduce redundant, manual steps. 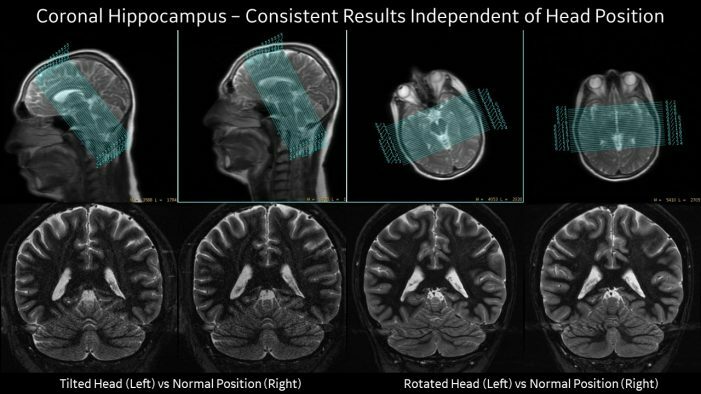 It uses deep learning algorithms built right into the MRI technologist’s workflow to automatically identify anatomical structures to prescribe the slice locations, and the angle of those slices, for neurological exams, delivering consistent and quantifiable results. “Every time I select a landmark for the prescription, the slice placement is dead on. Every time. It’s very cool,” says Tom Schrack, ARMRIT, MRSO, Manager of MR Education and Technical Development at Fairfax Radiological Consultants in Fairfax, Virginia. Schrack and two other senior technologists at Fairfax Radiological Consultants have used a prototype of AIRx –which stands for Artificial Intelligence Prescription(AI Rx)–since early November 2018, conducting about 15 cases on their facility’s SIGNA Architect3.0T MRI scanner. AIRx recently received FDA clearance. Schrack and two other senior technologists at Fairfax Radiological Consultants have used a prototype of AIRx – which stands for Artificial Intelligence Prescription (AI Rx) – since early November 2018, conducting about 15 cases on their facility’s SIGNA Architect 3.0T MRI scanner. AIRx recently received FDA clearance. AIRx is built on Edison, a new platform that helps accelerate the development and adoption of AI technology and empower providers to help deliver faster, more precise care. Edison can integrate and assimilate data from disparate sources, apply advanced analytics and AI to transform the data, and generate insights to support clinical, financial and operational decision-making. By leveraging this platform, AIRx features a pre-trained neural network model that leverages deep learning algorithms based on a database of over 36,000 images sourced from clinical studies and reference sites. Schrack is sharing his feedback to augment and refine this database. AIRX helps increase productivity by simplifying workflow steps, thus reducing prescription times. AIRx can significantly reduce user prescription time, and a study showed average prescription time savings can be up to 62%*. Regardless of the way the head is positioned in the scanner, AIRx will compensate creating consistency whether scanned today, tomorrow or a year from now. It also helps produce images that have less variability between technologists and between scans, helping to lower the chances a patient will be recalled due to incorrect slice placement. An increase in consistency is particularly important when doing longitudinal assessments. Schrack says AIRx is one step in the right direction of fulfilling the promise of AI, with the potential to use it on complicated anatomy, while continuing to simplify the technologist’s job. AIRx is not CE marked and not available in all regions.